Sugar, especially the bright white, refined kind we all grew up with, has always been a nutritional no-no. It spikes your blood sugar, increases inflammation, and sends you on an endless roller coaster of cravings. And artificial substitutes like Splenda and Sweet ‘N Low come with chemical baggage we’d rather avoid. So we asked Erica Giovinazzo, MS, RD, Clay Health Club’s resident nutritionist, if there was any sweet salvation in the bevy of natural alternatives on the market. She helped us sort through the options and the marketing—from agave to stevia and even Sugar in the Raw. Pro: Agave has a lower glycemic index, meaning your body absorbs it more slowly than refined sugar, so you avoid the typical blood-sugar spikes (and crazed rush). And it’s vegan. Con: Agave, which comes from the same cactus as tequila, is primarily fructose (90 percent). While fructose breaks down more rapidly than glucose in the liver (that’s good for blood sugar), an excess can lead to a greater production of fat and “bad cholesterol,” says Giovinazzo. Oddly, it’s 10 calories more per tablespoon than sugar. Flavor and Uses: Its liquid, melt-y quality is ideal for stirring into cold liquids (lemonade!) without the sometimes cloying taste of honey. It’s not as ideal for baking, although it can be used with some adjustments (either less additional liquid or more starch). Pro: It’s the hands-down favorite of nutritionists because of its low glycemic index. Made from the sap of the coconut palm tree buds, it’s not as chemically processed as other sugars, according to Giovinazzo. And it’s rich in vitamin B8 and potassium, though nobody’s recommending it as a multivitamin substitute. Con: It’s expensive. Depending on the store, it tends to be about four times more expensive than Domino. Flavor and Uses: Of the natural options, it tastes the most like regular sugar, although perhaps with a slight caramel taste (but what’s wrong with that?). It’s great in baking and can be substituted 1:1 for regular processed sugar. Pro: It’s loaded with an array of vitamins and minerals, including B2, B6, iron, and manganese. Its anti-fungal and antibacterial properties ward off colds, explains Giovinazzo, and there’s a possible probiotic effect (the good bacteria similar to that found in yogurt). Raw honey has a high level of antioxidants, and the darker honeys have even more. Con: Watch out blood sugar: honey’s glycemic index is higher than agave’s (though it’s still lower than refined sugar). Calories ring in the same as agave (60 calories per tablespoon). Flavor and Uses: Honey’s soft sweetness is genius in tea. It holds up fine in baking as a replacement for white sugar, though it retains its distinct honey taste and, like agave, needs some adjustments (reduced liquid and added baking soda) to make up for its liquidity. Look for raw honey, which is less processed and thus retains more nutrients. Pro: Piped straight from the tree, this sweetener couldn’t be any more natural. (We’re not talking Mrs. Butterworth here.) Pure maple syrup is high in antioxidants, zinc which boosts the immune system, and manganese necessary for the body’s enzyme reactions, says Giovinazzo. Plus, maple syrup has been linked to improved brain health. Con: Unless you really love the taste, it probably wouldn’t work in tea, coffee, or other beverages. At 51 calories per tablespoon, it’s about the same as table sugar. Flavor and Uses: Tastes like Vermont. It’s great as a topping for pancakes, yogurt, or oatmeal, but maple syrup also works fine in baking, with reactions similar to that of honey. Pro: It has a high nutritional value, especially the blackstrap variety, which has 70 percent more potassium than a banana, 20 percent of a woman’s daily requirement of iron, and as much calcium as half a glass of milk, according to Giovinazzo. It’s made during the processing of plain sugar, so it holds onto the sugar cane’s original nutrients before the refined sugar is stripped out. “Everything that’s good about sugar is in molasses, and everything bad about it, is in the refined version,” she says. Con: It’s not a health food, even with its nutritional profile. And its strong taste isn’t great for beverages or for baking, unless we’re talking dense flavorful baked items like gingerbread. Flavor and Uses: It hints of smokiness and is best drizzled into smoothies or yogurts, and even chiles. Calories are the same as sugar for blackstrap molasses; regular molasses weighs in the same as agave and honey, 60 calories per tablespoon. Pro: Calorie-free and natural, it comes from the stevia plant. It’s sweeter than sugar, so you don’t need to use much. “It seems to have no side effects, and is a better choice than Splenda and friends,” says Giovinazzo. Flavor and Uses: Stevia’s an intense sweet hit. It mixes into beverages and sweet cocktails nicely, but it’s not great in baking, and needs to be majorly reduced: plan for a 1:8 stevia/sugar ratio. Pro: These sugar subs ending in “ol” are extracted from plants or manufactured from starches. They’re much lower in calories than sugar (and most of its stand-ins) and have less of an impact on blood sugar. Con: They can be stressful on the GI tract, causing unpleasant digestive symptoms. Like all sweeteners, they may perpetuate sugar cravings because your body expects calories when sweetness is on your tongue. When the calories don’t come, says some nutrition research, the body will be left wanting it. Flavor and Uses: You’ll find these sweeteners in lots of packaged products like flavored waters, sugar-free gum, and nutrition bars (erythritol is often paired with stevia on ingredient lists), and they’re often used in products for diabetics because of the low blood sugar impact. Pro: This brown, crunchy sugar, which is also called “turbinado” is essentially the same as white cane sugar but is slightly less refined, so it’s retained some of the molasses. Some say white sugar is “bleached” with sulfur dioxide, while sugar in the raw is not, says Giovinazzo. Con: When it comes to your health, it’s still basically the same as regular refined table sugar—lots of calories, a blood sugar spike, and so on and so forth. Again, it’s not a health food. Flavor and Uses: This is the go-to coffee sweetener for cleaner-living types who still frequent Starbucks. It’s great in coffee and tea and is also great for baking. But it’s not a straight swap for refined sugar. It’s just as sweet, but much more coarse. Originally posted March 28, 2013, updated July 23, 2018. 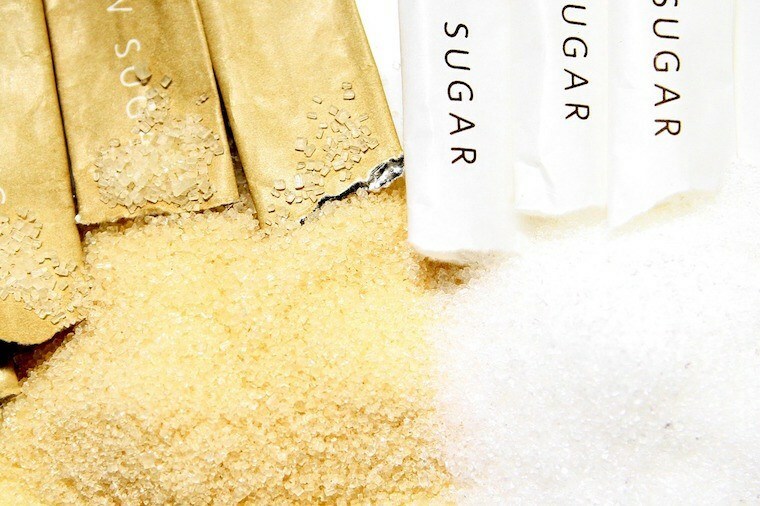 Think you’re pretty good about your sugar intake? You may not realize how much you’re getting in these 5 unexpected foods. And here’s how to cut it out entirely.